ummer is here and you may be planning on hosting or attending a picnic, pot-luck, or barbeque. But how to save yourself for the main meal while navigating the tempting snacks that might not be the best choice for you? 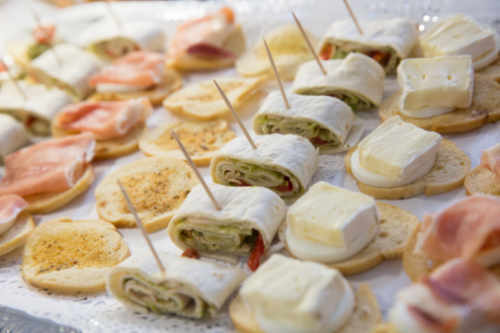 If you are hosting your own party, have some healthy choices for you and your guests. Let’s look at some smart snack choices to help you enjoy without over-indulging. 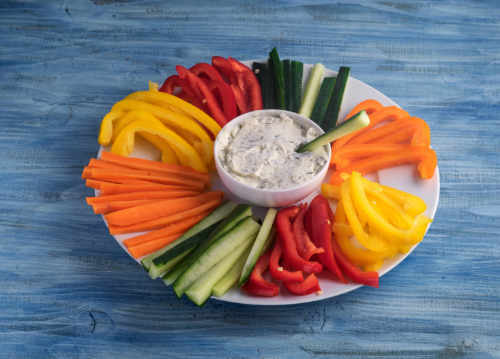 Add a layer of hummus to a light tortilla and fill with your favorite veggies: peppers, cucumbers, and shredded carrots. Roll it up and secure it with a toothpick. 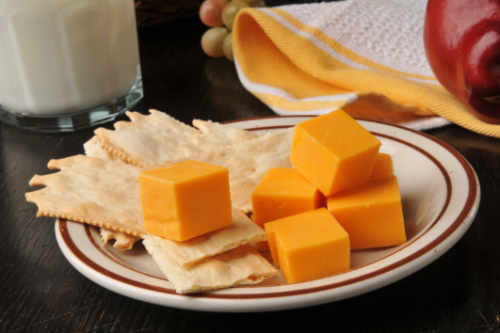 A plate of flatbread crackers and cheese is always a hearty and satisfying snack. Try a variety of cheese like swiss, cheddar and pepper jack. Layer a mason jar or mug with a layer of non-fat Greek yogurt. Add berries. Drizzle each layer with honey and cinnamon. Arrange a beautiful platter will a rainbow of colorful veggies. It will satisfy your munchies and keep your blood levels at bay. 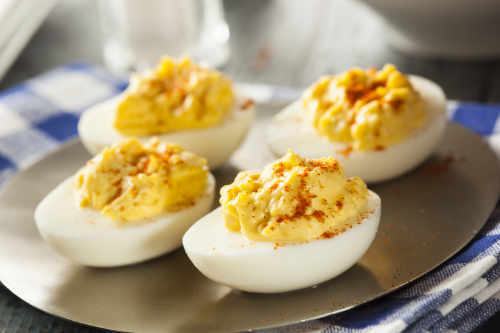 Slice the eggs in half lengthwise, remove the yolks and mash in a bowl. Add mayonnaise, vinegar, mustard, salt, and pepper and mix well. Evenly place the mixture into the egg white and sprinkle with paprika. Prepare mint, cilantro, red bell pepper, corn, carrots, and purple cabbage. 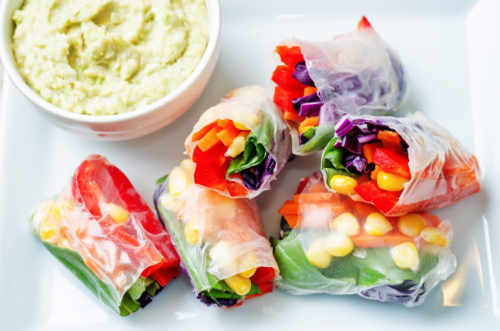 Assemble the spring rolls by soaking the spring roll wrapper in warm water until slightly soft. Arrange the vegetables inside and sprinkle rice vinegar over on top. Roll up. Serve with Sriracha-mayo sauce. 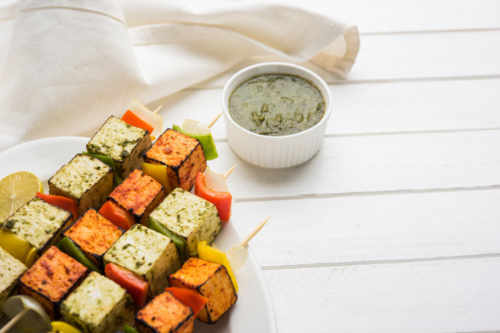 Alternate paneer onto skewers with peppers and onions. Place on a baking tray lined with foil. Grill the skewers for 10 minutes, turning half-way through until the paneer is hot and the vegetables are slightly charred. As always, be sure to check with your nutritionist for the best snack choices for you. It might be a good idea to have your green smoothie or have your meal before you attend. It may be a good idea to measure your blood glucose before you head out, just so you know where you stand so you know the limits to enjoying your food and know where to limit it.